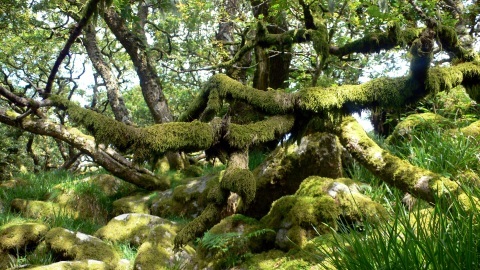 Wistmans Wood on Dartmoor is the last remnants of an ancient woodland and home to a pack of Yeth Hounds. They are a fiercesome sight, jet black with smoke and flames snorting from their nostrils. From the centre of the wood they start their wild hunt led by a demonic huntsman called Dewer. They race across the wild moorland looking for lost souls and heading for Dewer Stone near Bickleigh where they disappear. So beware approaching Dewer or his hounds as speech with the Huntsman means a sudden and painful death. Beneath the faerie rings where the pixies dance at night gold can be found if you dig deep enough. Put your ear to the sides of the Tors and you will hear the pixies knocking deep within the rock or if you are really lucky you will be able to hear the bells being rung in their underground villages.